Me (right) and my sissy visiting E.B. 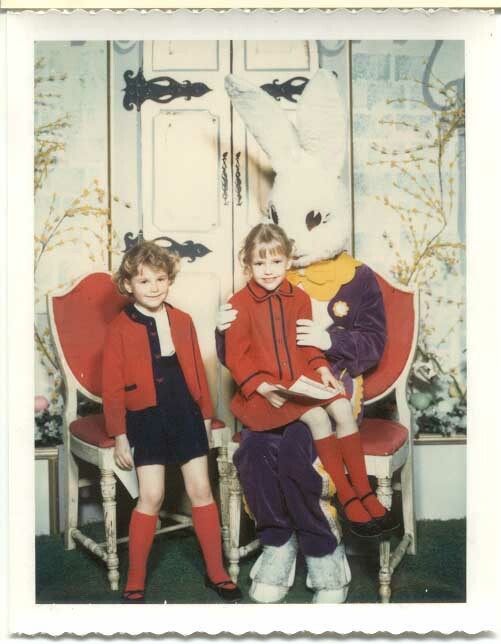 I grew up in the Chicago suburbs. Chicago was home to a famous amusement park called Riverview. It operated from 1904 until 1967. My doting Aunt Vickie thought that it would be a good idea to take me and my older sister to the Riverview Freak Show. We didn’t know better back then. Curiosity beat out compassion and common sense every time. Science hadn’t taught us about genetic mutations and skin diseases. I took one look at The Alligator Woman and became physically sick, much to my sister’s delight. I much preferred Aladdin’s Castle fun house to the freak show. Thinking about this experience caused me to ponder the other “freaks” including the bearded woman and the fat man. “Human Freight Car” Chauncey Morlan, weighed 400 pounds at age 14 and took his show on the road at age 15. By his early 20’s Chauncey had beefed up to 748 pounds. 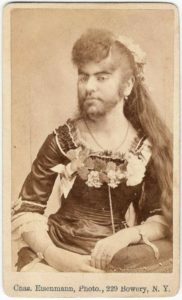 He married “The Ohio Giantess” where they were exhibited at various locations, earning enough money to buy an estate in Indiana. He died at age 37. 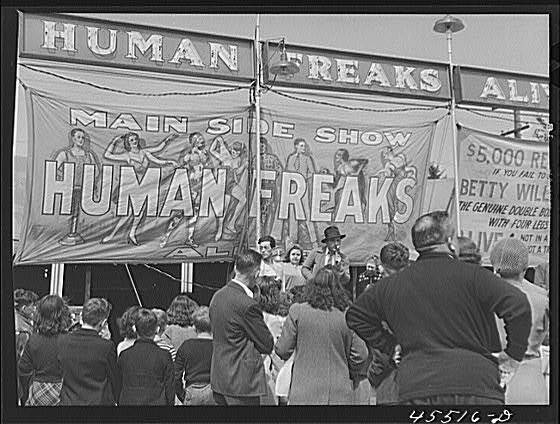 Although freak shows are now against the law, they continue in a different form. People like Donna Simpson, the world’s heaviest mother (gave birth weighing over 532 pounds) used to make a living from being fat. People subscribed to her video channel to watch her eat her way toward a goal of weighing 1,000 pounds. That party is over, once she hit 600 pounds she decided to try to lose weight and get out of the spotlight. We are no longer shocked to see obese people, and we aren’t buying tickets to peek inside the “freak show” tent. 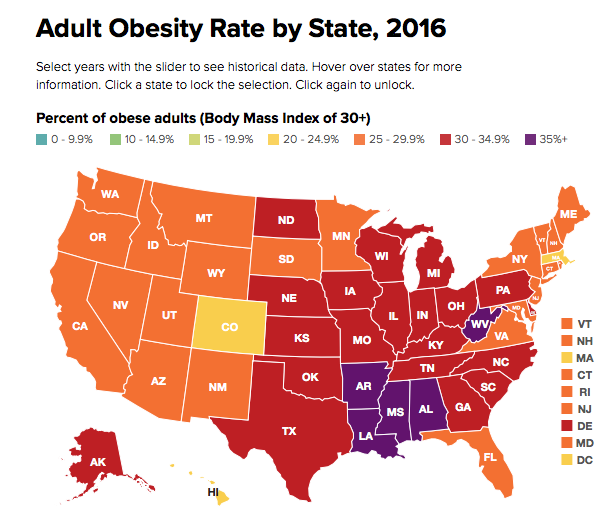 Check out these maps showing the percent of obese people 1990, 2000, 2010 and the latest data from 2016. Typically, thinner people think that overweight people need to just put the fork down and exercise. It is not that simple and it is not your fault that food manufacturers create food that is addicting, fattening and full of harmful chemicals that damage metabolism. The government is quick to point the finger at fat while telling us to load up on bread, cereal, refined grains, pasta and bagels. We dutifully load our grocery carts with low-fat and fat-free factory food, shunning butter, nuts, avocados and eggs. Eating whole food, as close to the way it was created, is not the reason that the CDC map is full of red and orange. 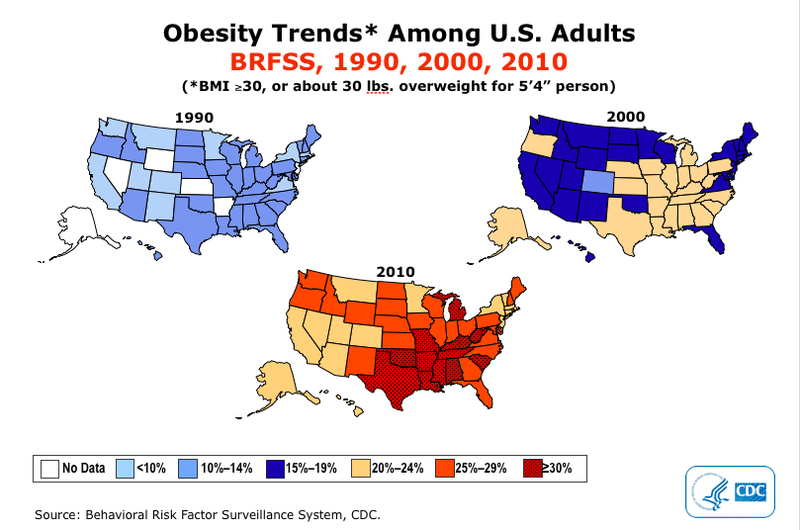 Why are 70.7% of Americans overweight (CDC data)? Why is diabetes, heart disease, insulin resistance, PCOS, infertility, high blood pressure, high cholesterol, auto-immune disease, fatigue, mood disorders, headaches, pain, and digestive distress spreading like wildfire? It is sugar and artificial sweeteners. It is red, blue and yellow dye. It is preservatives, chemicals and hormone-laced food. It is genetically modified corn and soy. It is industrially processed oils like sunflower oil, safflower, corn and soy oil. It is the lack of fresh food in the diet. I see people grab hold of this message and change overnight. They start eating real fat from organic butter, unrefined coconut oil, olive oil, nuts, avocados, eggs, meat and fish and feel amazing and lose weight. They stop eating refined sugar and refined grains in the form of bread, pasta, baked goods and chips and never look back because they feel so healthy and energetic that they do not want to go back to their old ways. They eat pasture raised beef, chicken, pork, lamb and bison, wild caught fish, and load up on vegetables and a little fruit, seeds and nuts. Why don’t you try a three week experiment. Just eat whole REAL food. Please tune in to my podcast archive show (Episode #87) with Dr. Michael Fox, OB/GYN and specialist in reproductive endocrinology. He will shed some light on PCOS and the symptoms including weight gain, facial hair, infertility and insulin resistance. Dr Fox is one of the world’s leading experts on treating PCOS and fertility problems. If your doctor is only prescribing birth control pills for you, please listen to the show and learn how you can make dietary changes that work!